On Wednesday, March 6, 2019, SIU will unite for a celebration of history and philanthropy. Events will mark SIU’s 150th anniversary and promote the third annual Day of Giving. The university’s continued success is directly connected to the generosity of its alumni, friends, faculty, staff, students and surrounding communities. That giving spirit is on full display during each SIU Day. For 24 hours, donors are encouraged to make an online gift to the college or unit of their choice. The amount raised and number of gifts is tracked in real-time at siuday.siu.edu, including a constantly updating donor wall. 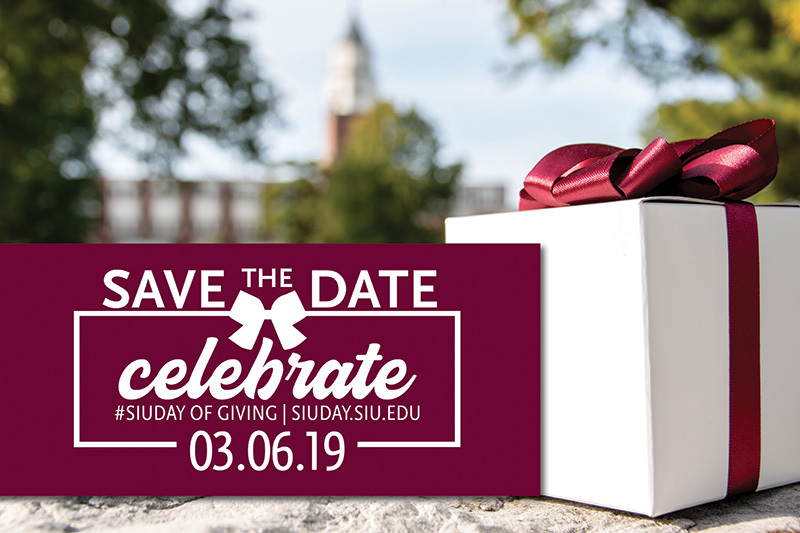 The first two years of the SIU Day of Giving raised hundreds of thousands of dollars through hundreds of individual donations. The funds have allowed the university to increase scholarships and enhance the student experience. SIU supporters can help by signing up to be online ambassadors and sharing their excitement on social media. For more information, visit siuday.siu.edu or contact Rebecca Renshaw, associate director of development communications, at rebeccar@foundation.siu.edu or 618/453-1328.